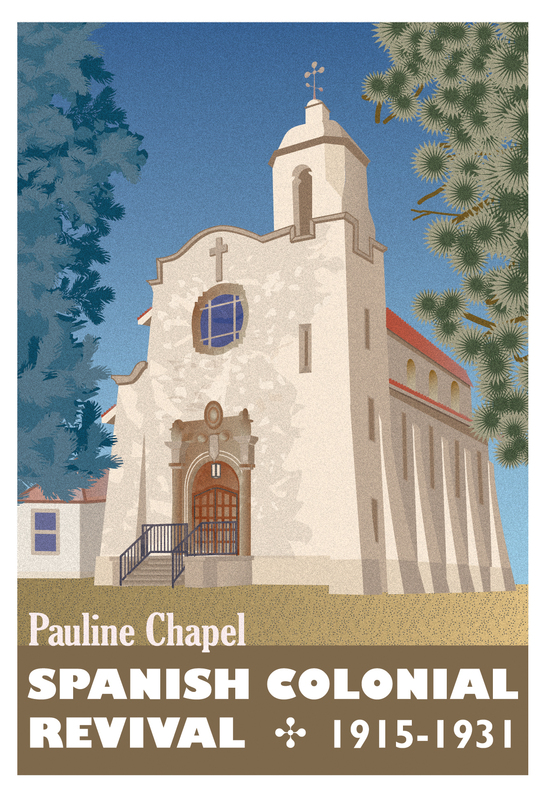 Inspired by the recent photo I took of the Pauline Chapel, I created a graphic illustration of this historic building. The strong play of light and shadow on the geometric stucco walls reminded me of the vintage 1930s travel posters of the great early 20th century graphic designer A.M. Cassandre (Adolphe Jean-Marie Mouron). His poster style drew on the avant-garde influences of Cubism and Futurism and integrated strong use of typography. 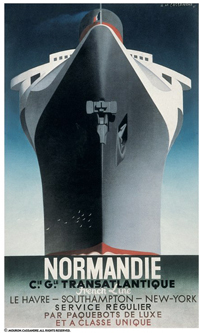 Cassandre employed airbrush and friskets (masks) to create his works of poster art. My illustration was developed using vector-based software tools in Adobe Illustrator CS4. I exaggerated the proportions of the Pauline Chapel, emphasizing the height and perspective of the chapel’s prominent tower. The composition was naturally framed by the Blue Spruce and Ponderosa Pine to the left and right of the chapel. I found that rendering vegetation proved to be challenging, so I chose a simplified approach. The German-born American print maker and painter Gustave Baumann created colorful, stylized woodcuts of southwestern landscapes. His stylistic approach served as inspiration for the two evergreen trees in my composition. Pauline Chapel is adjacent to St. Paul Church near the Broadmoor Hotel in Colorado Springs. The Chapel is a notable example of ornate Spanish Colonial Revival and its antecedent style, Mission Revival Style, which both draw inspiration from the early Spanish missions of California. The Chapel was built in 1918 by the prominent Colorado Springs architectural firm of MacLaren and Hetherington under the close supervision of local Colorado Springs philanthropist Julie Penrose. The chapel is named after the Penrose’s daughter, Pauline Penrose. The Pauline Chapel was added to the National Register of Historic Places on February 26, 2001.